Alexa, ask Google how do you know when a pineapple is ripe? The Ask Google skill is one of the best Alexa skill you can install. Now you can get Google answers from your Alexa device! 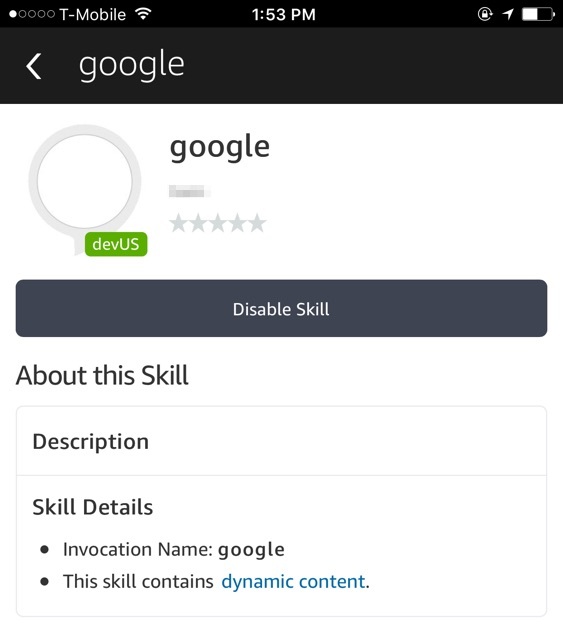 Unfortunately, the skill is not available in the Skills store because it is a conflict of interest for Google since they have their own competing device. But luckily, we can manually install the skill to our device for free. An update to the Ask Google skill was released on January 22nd. Read about the changes here. Need to update your skill? Read our guide here. Check out our newest guide, how to install Google Assistant to your Alexa device here. 1. 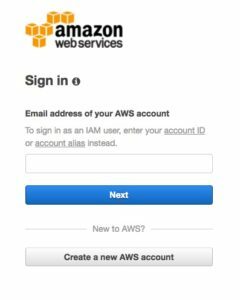 Create a personal AWS account here using the same email address used to register your Echo device. 2. You will need to enter a credit card even though we will be using a free plan. 3. In the Support Plan page, select the Basic plan. 4. Once your account is created, go here and sign into your account. 5. Click on the region drop-down next to your name on the top-right corner and select “US East (N. Virginia)” if you live in the US or “EU (Ireland)” if you live in the UK. These are the only two regions that support Alexa. 6. Now click on Services on the top-left corner and go to Lambda under the Compute section. 7. 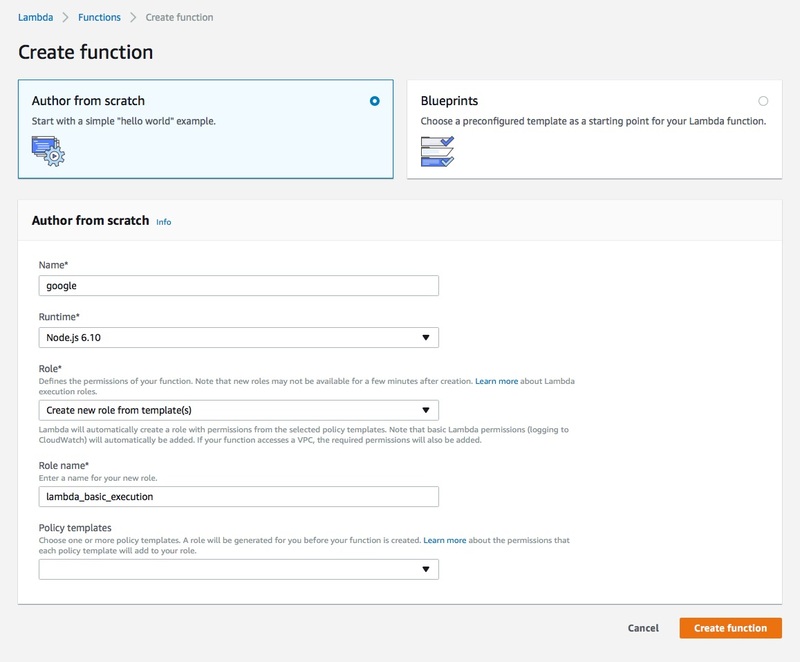 Click on the Get Started Now button or Create function to create a Lambda function. 8. Click Author from scratch. 9. Name the function “google”, select Create new role from template(s) for the role, name the role “lambda_basic_execution” (or select Choose an existing role and lambda_basic_execution if the role already exists), and press Create function. 10. Under Add triggers, select Alexa Skills Kit and press Add. 11. Click on “google” to return to the configuration settings. 12. Under Function code, select Upload a .ZIP file for Code entry type and upload the Archive.zip file. You can download it here (click Clone or download > Download ZIP). Unzip the downloaded file and the Archive.zip file will be located in the src folder. You can leave the rest of the settings as default. The Runtime should be “Node.js 6.10“. 13. Under Basic settings, enter “google” for the Description and change Timeout to 10 seconds. 14. This is what the completed Configuration page should look like. Press Save on the top of the page. You may receive an error message, “The deployment package of your Lambda function “google” is too large to enable inline code editing. However, you can still invoke your function right now.” This is fine. 15. Copy the ARN code on the top-right corner. It should look something like “arn:aws:lambda:us-east-#:############:function:google“. We will need this later. 16. 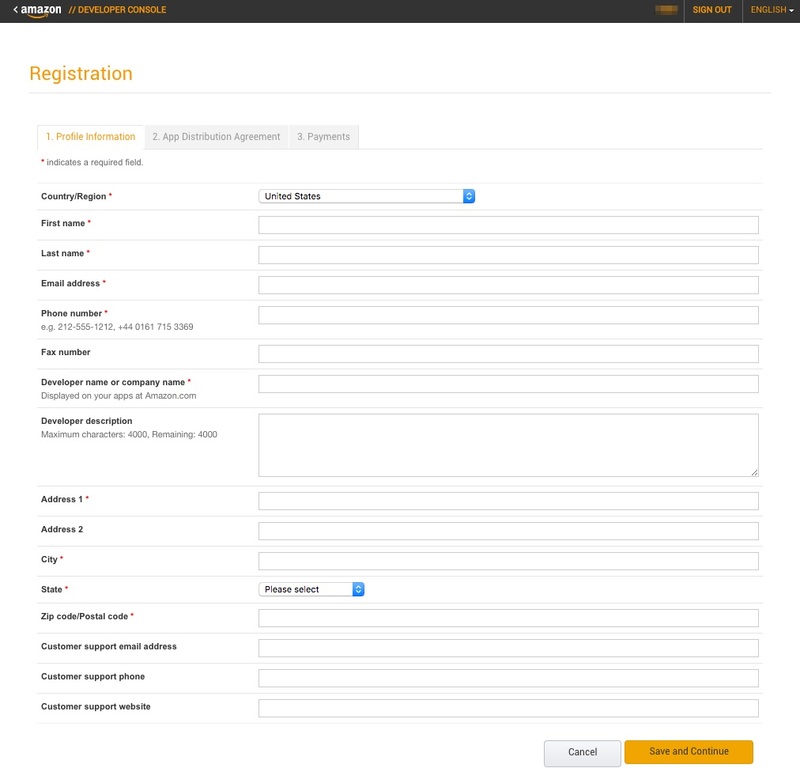 Now create a free Amazon Developer account here. 17. Under the Payments page, answer No for both questions. 18. Sign into your account here and go to the Alexa tab. 19. Click the Get Started button under Alexa Skills Kit. 20. Click Add a New Skill. 21. 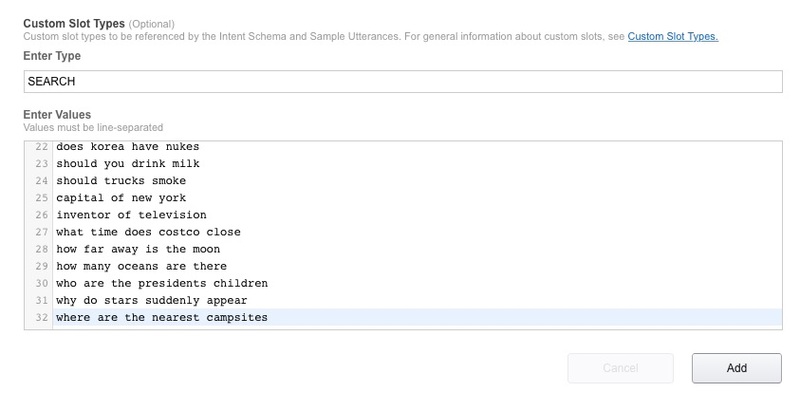 Set the Skill Type to Custom Interaction Model, select the correct language (US, UK, and German options available), name the Name and Invocation Name field “google“, and hit Next. 27. Select AWS Lambda ARN (Amazon Resource Name) for the Service Endpoint Type and paste your ARN code (from step 17) into the Default field. 28. Select No for the Account Linking question and hit Next. 29. You will now be in the Test stage. You’re done! You will find the google skill in the Alexa app under Skills > Your Skills. To use the skill, simply call Alexa followed by the phrase “ask Google“. You will now be able to ask Alexa even more trivia questions than before! If you have any questions or comments, feel free to leave it below and we will try to answer them quickly. Make sure you unzip the downloaded file from GitHub and upload the “Archive.zip” file located in the src folder. I’m getting the same thing, alas. I’m sure I uploaded the Archive.zip from the Git pull. Great skill, and thanks for posting with these details. When I first set this up I couldn’t get it to work. I’d set my Amazon Dot’s language to UK English just because I liked the accent. When I set it back to US English, the Google skill started working. I’ve found exactly the same thing. Fantastic guide, and the process was fairly simple but the skill itself doesn’t work (I’m in the UK) unless I change the language settings in the app to English (United States). Then I have to listen her talking to the family in American English all the time! Thanks for a great guide, by the way! There was a missing step in the instructions above – which Alexamods has now clarified where you need to set the skills language to English(UK) in step 23. If you edit the skill with this setting and set your device back to UK English then it should work fine. Well I realized my mistake, I uploaded the entire zip file from githib, I was supposed to extract the zip file then upload the Archive.zip file in the /src/ directory. Then I had to figure out how to delete the old lambda_basic_execution role from AWS. That was difficult for someone with no idea what any of this means. I eventually found it by going to Services dropdown on top, select IAM under Security, Identity, & Compliance. Then there was a link to Roles, and from there I could delete the old role. I found that you actually do not need to go through all the steps again or delete the old lambda_basic_execution role from AWS. Simply navigate to the “Code” tab in the Lambda AWS console and upload the new code (Archive.zip). This should also make it easy to update to a new version of the code if updates / bug fixes are made. Did that as I uploaded the whole zip file and got this: Your role is not ready, or cannot be assumed by Lambda. Please wait up to a minute and try again. Wow! this is mega and very easy to follow! Thanks so much for the guide, my echo is now more useful than ever! Thank you for your FANTASTIC step-by-step instruction guide. Very easy to follow!! I’d like to know what skills you’ve developed so that I can support your work. This is a great tutorial. However it didn’t work on mine until I added a new Language the same as my dot. The default appears to be English(US) and I had to add English(UK). But then Google (Via this skill) also understands context as when I asked “How far is the moon” she answered in Kilometres, so I asked “Alexa, ask google how far is that in miles” and got the correct answer. How did you add the English UK language? Was it just changing the setting in the Alexa app? How/ where do you ‘add English (Uk)’? My apologies. I didn’t clarify in the original guide. I just revised it. Take a look at step 23. You need to change the Language field to English (U.K.) or German (if you live in Germany). you may also need to create a European ARN too ! Great job, very detailed instructions. Seems to be working great, now trying to find things that Alexa doesn’t know but Google does. Can we integrate with google to access account specific details, such as traffic to a destination on my calendar? Google home seems to be able to. This is great, thanks. As a long time software technical author, I really appreciate the effort in what is, for me, a new area. I also enjoyed reading the comments which led me to your update for English UK which I had already set. I love this and I know my grandchildren will enjoy firing their questions at Alexa with the google option. That’s so good. It works . Thank you ! Is it possible to push photos to the Fire TV stick from the google search skill? Glad to hear that it works on the fireTV. I am unable to test this though as Alexa functionality isn’t available on the FireTV where I am based. I am thinking of embedding a photo if this is found in the results into the alexa app card which *should* then display on the firetv, but I’m only guessing at this stage! SImply awesome! Excellent documentation, thank you for the gift of your time writing this up for the WWW. I GOT IT TO WORK! GAME CHANGER!!!!! The login I use on my echoes is not the same as I use for my AWS console, or what I would use for the AWS developer site. Different email addresses. How do I see the skill that I created under one account, that is not the same as the account on the echo/alexa? I am getting an error that says ‘Role with name lambda_basic_execution already exists’ and can’t get by the “create function” page. Any ideas? Question when ask what a lion sounds like or any other request like this it gives me the http website not the sound. Did I do something wrong? Brilliant. Thank you very much. I’ve now found my way around lambda & alexa skills. Hopefully I will start writing my own skills now. Stuck on the Create Function Page. Just keep timeing out. You may need to set your computer’s date and time to “set automatically”. Great Job!! Works, thanks for the hard work!! This is so fab – I’m not a coder but your step by step instructions were easy to use, and now I have much better search results using google. I keep getting I do not know the answer to that. HELP! I was struggling with this as it failed every time, the system timed out, so I uploaded the file Archive.zip via S3 – which is another whole bunch of sign ons – but once that was done and uploaded, everything went just as per the instructions – thanks for this, excellent bit of work. I deleted the Skill and recreated it, following the detailed instructions but Alexa doesn’t recognise the Skill even though it appears within the App. I have it set to N. Virginia and everything, and I did not have any issues creating my AWS account. Did anyone have this issue as well? I checked the emails from AWS and there was nothing indicating that I needed to click on anything else to activate the account. And I have tried on my laptop (Internet Explorer) and phone (Chrome) with the same results. I am having this same issue. Have you figured it out yet? I just waited overnight and it appeared to start working by itself. Then I had the issue that the lambda_basic_execution was already created so I had to choose “Select existing role” or something like that. Then it gave me an error saying that “Something went wrong” after I did everything so I downloaded Chrome and I finally got through everything. Just finished it right now and it appears to be working ok. NOTE: You MUST create AWS accounts with the email address you use in the Alexa app. I have multiple accounts, and you can only get it to link if using the same account throughout. If you enable this skill, once you say “Alexa, ask Google to….” will it continue the dialog like Google Home does…like its a conversation without having to readdress Alexa if you ask it something else pertaining to the initial request? The way Google Home works with responses??? Or does it just use Google as its search engine??? Very detailed, clear, and concise guide. Great search option for the important questions such as: “what color are bananas” and “how far is the moon.” I still have to figure out how to ask google when Daylight savings kicks in… maybe someday I’ll get it (haha). Thank you very much for this guide and don’t give up on our quest to mod Alexa!!! I get to “configure triggers” and Alexa Skills Kit is not one of the options. Help?? You need to change your region via the drop down menu to one that has the Alexa Skills allocated to it. Step 5 above refers. Great tutorial. Works like a champ. Although, I’ve read through the “Free Tier” pricing information several times and it’s still not clear just how much you can use a skill before you start getting charged a fee. If someone can explain their numbers in more “simple” terms that would be great. You get “1,000,000 free requests per month and it does not expire at the end of your 12 month AWS Free Tier term.” So unless you go over 1 million requests a month, you will not be charged. Thank you for making this super easy for me to do! I have never done anything like this before and I was able to accomplish it in one try! Thank you for this fantastic skill and thanks for having Alexamods create the installation instructions. He/she did a fantastic job with that. I had absolutely no problems following the instructions. Have you authored any other skills? I’d really like to know which ones, if you have. I truly appreciate what you’ve shared with us and I want to support your work!! 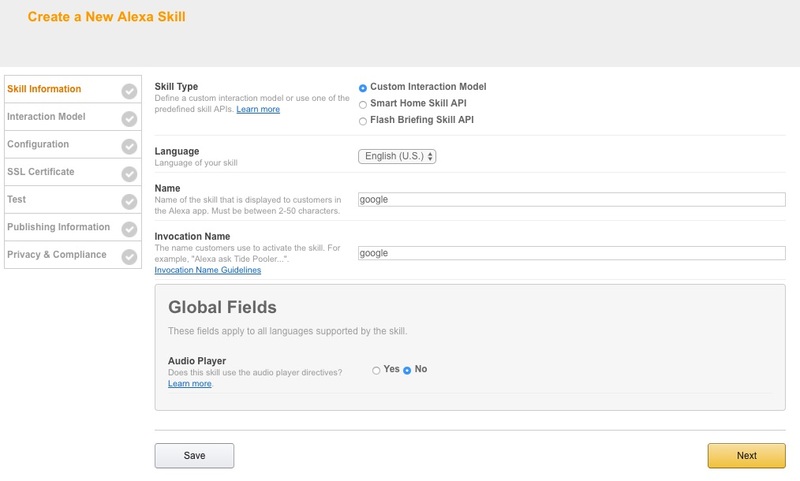 As was the case with Brad, I don’t get Alexa Skills Kit as one of the options in Lambda. Thanks alexmods for great tutorial, The Alexa skill worked first time. I was able to follow your guide OK but I found it easier to follow by printing it off instead of flicking from screen to screen. I’m a novice as far as this type of thing is concerned but this step by step guide is the business. Thanks again. It’s taking quite a bit of time at the “create function” step for the Lambda Function. What’s typical and when would it appear to be hung up? Thank you. I think something has changed. 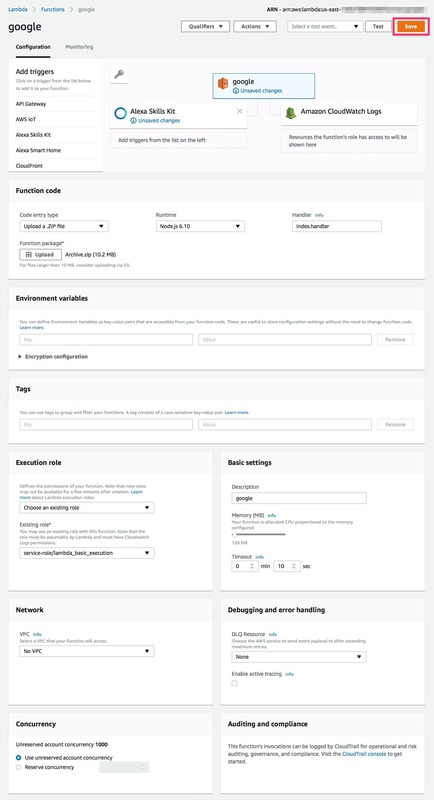 All the options in “Configure Triggers” (step 9) are there except for Alexa Skills. Fixed. That was my fault. I didn’t use the correct time zone. Great tutorial. Easy to follow and makes my Echo so much better. Please help! I had the problem with the install. Started over. Everything worked fine until I got to “Custom Slot Type”. When using the values stated in the instructions, I get the message, “Error: Custom slot types must have unique names. Given name is a duplicate: SEARCH. I’m stuck here. Any suggestions for getting past this step. Thank you in advannce. There was a problem with the requested skills response. Not sure what I did wrong or how to fix. NEVER MIND ON MY LAST COMMENT! I had to re-download the archive zip file and I am good to go! Never mind! It showed up and works perfectly… Still won’t give me tidal info, tho… Thanks! Love it! I also made the mistake of not extracting the zip file and had a heck of a time figuring out how to correct. Read through the comments and one user gave instructions that helped! Very well written and works great. Thank you so much! Very nice instruction sheet! Works good. Note, however, Amazon Web Services DID charge me $1. Not a big deal but I was a little surprised. 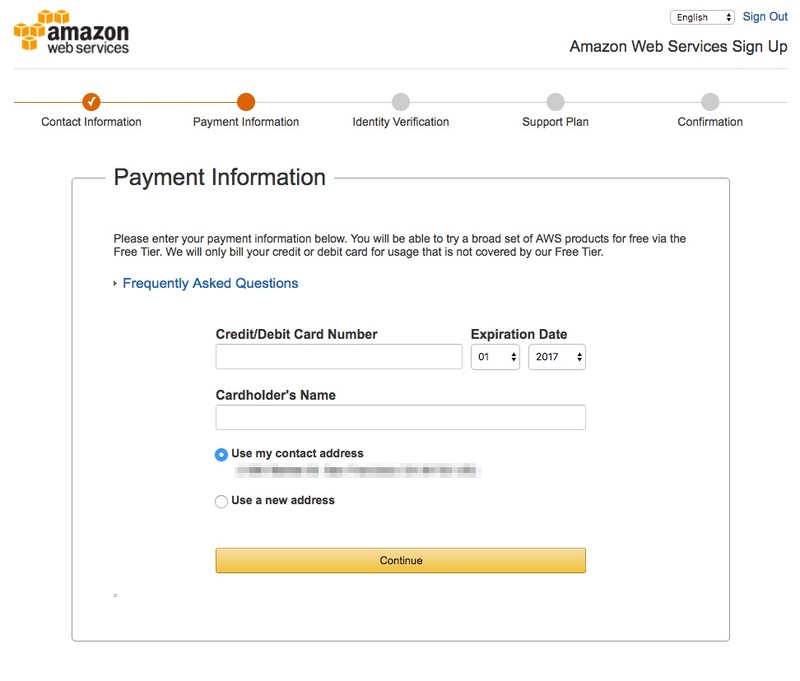 When a new card is added to an AWS account, a small charge is sent to verify that the credit card is valid and hasn’t been reported lost or stolen. AWS doesn’t proceed with the charge, and the charge should disappear within three to five business days. After Step 30 I get the error “Error: Please make sure that “Alexa Skills Kit” is selected for the event source type of arn:aws:lambda:us-east-1:(DELETED):function:google” It seems like a simple fix, but for the life of me I cannot figure out what to do. Thank you for any help that can be provided. I got the same thing. 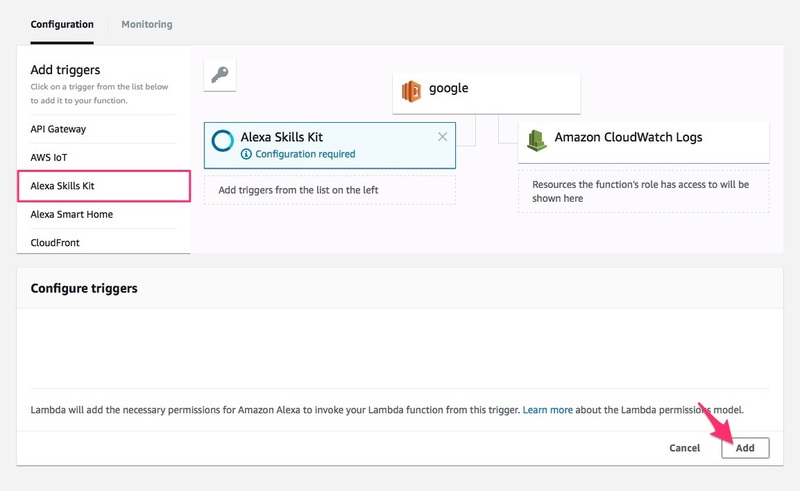 The solution is easy: back in the lambda management console you click the triggers tab and choose Alexa Skills Kit again. I don’t know why it didn’t save the first time, but once I’d chosen it again I could continue with the rest of the setup. Works really well! This is perfect – well done. Alexa has had her IQ enhanced. This is awesome! Worked perfectly! Thanks!! Fantastically detailed instructions (that clearly work!) but not for me. I am UK based too and have got as far as step 16 but the Create Function just remains greyed out (after clicking) with the activity arrows just looping around and around. I have checked that time/date are automatic (they are). If I cancel and re-do I see that the function has been created. Have deleted and re-tried from scratch several times. Suggestions?! Hi great tutorial. I have the skill enabled in my Alexa app but anytime i ask a question it says there is a problem with selected skill request. Thank you so much! This is great! Very easy to follow. Quick update. Just re-did the whole thing (on a Linux box, this time) and had no problems at all. Thanks again for a great walk through. Thanks for all your efforts. My Alexa app is on my iPhone, and I went through the entire Google process on my desktop. My app on the phone shows the google skill installed and enabled, but when i ask Alexa I get the reply, ” There was a problem with the requested skills response.” Any ideas? Damn, this is driving me crazy. I established an AWS account, but when I went to configure triggers in lambda the drop-down list does not show Alexis Slills Kit. What am I doing wrong?! Brilliant – worked first time. Thank you!! Thank you! I was able to get this installed the first time because the instructions were so detailed. Easy to follow installation instructions and the skill works great! Thanks for doing this. How did you get this to work ? Type SEARCH, all caps. I had the same thing happen and that’s what I did to fix it. Did you get this to work? I’m using SEARCH in all caps per the instructions but I’m getting the same error. Tried typing it and C&Ping it. Great instructions! Thanks a lot for sharing this. Silly me, what I should have been doing is ask the question all the way through e.g. “ask google how many days in a year” not “ask google” then wait for the welcome to google search and then ask “how many days in a year” it does not work that way. Great instructions, followed them to creating a free Amazon Developer account but am now getting a message “Unauthorized In your current role, you are not authorized to access this page. Please contact your App Distribution Portal account administrator” I’m clearly doing something wrong. I’m a private user, I’m using my personal machine on a domestic internet account. Using a desktop with Ubuntu 16.04 if this helps. Role with name lambda_basic_execution already exists. You first need to delete that ‘role’ – instructions in comments above. Have created the skill (N. America) etc, and it showed up in my skills list were I enabled it. “ask google for the temperature (bla bla) “I continue getting the following response from Alexa. It worked and adds Google to Echo. However, some things don’t work like they do directly with Google such as distance between places and drive times. It does add additional search ability to Echo which is nice. @Tartan_guru: Very nice! Very easy to setup and use! One thought: Put the search url in the Alexa history. That way if the user wants to go into more detail on the query response, they can click on it and go to their browser for more details. Everything shows that the Alexa Skills Kit was chosen at the proper time. Great instructions! I got this to work without issue. Thanks! Awesome…worked flawlessly. Thanks for the guide. Great job!! Thanks to your detailed guide, Alexa got clever than before. But a very trivial thing to say. Alexa recognize your example “how many Grammys has Drake won?” as “how many Grammys has Drake 1”. I made google speak that sentence but the same results. Is your Alexa hear that right? – American English speaker in Japan, virtually in Seattle. I absolutely cannot, cannot thank you enough for this. I loved Alexa when I first got her, but came to complete frustration with her stupidity over time. I would say “Alexa, you are incredibly stupid” and she would say “I can’t find the answer to your question”. I carefully followed your instructions and the skill worked perfectly!!! I asked Alexa some harder questions and, of course, she expressed ignorance. Then I had her use the skill and out came precise and correct answers. I have been waiting for a skill like since a few weeks after I got Alexa. You have admirably supplied it. I am receiving the error: “Invalid ARN for NA region. Please provide a valid ARN…”. The ARN is US East (N. Virginai) and shows as “ARN – arn:aws:lambda:us-east…” similar to your instruction. Any ideas? I unzipped the archive.zip file but when I go to upload it to AWS it wont up load the file. It makes me pick one of the files in the archive.zip file to upload. How can I get the whole file to upload? It wont let me select all files in the archive file to upload. Followed the clear cut instructions, Thanks. I can test it and get the results but it will not appear in my skills. I have made sure that i am using the same email address in both the Amazon developer and AWS management as well as my Dot. Does it appear straightaway or do you have to wait? It should appear right away. Should I ignore this, or do I need to “subscribe” for this skill to work? It worked. A good way to test is both ask Alexa to ‘ask google’ and then type the very samy question on google serch. Alexa will read the exact response. Funny thing, though. I asked: ‘how many super bowls has Tom Brady won’. Alexa read answer below, but could not read the last roman numeral correctly. Instead, she said it as it was a word. Excellent tutorial! Thanks. Worked great for me in North America. Quick question, if I have this skill, is there a way to share it to my room mate on their Echo without creating the whole thing under their own developer account? They’re not so tech savy and I’d rather just share if possible? Nope, you will have to install it again using the email address associated with the Echo account. Excellent tutorial. Worked great. I did get the “You are not subscribed to this service….” message but I waited a little while and then everything worked. It must take a few minutes for everything to be setup in your account. But other than that it worked great! Thanks!!!! Great instructions – many thanks. Thanks so much for sharing. Works great. used your direction and the one on github. i keep getting this error. The remote endpoint could not be called, or the response it returned was invalid. i have gone through all the steps a few times. and re uploaded the archive.zip file a few times. any ideas? Worked perfectly on the first try. The steps are easy to follow. I found it helpful to copy and paste the different required text strings to a word doc for easy reference as I stepped through the procedure. UK English does work. But you need to modify the code. MEGA DOPE cool awesome!! I love that you shared this! It fills me with joy and happiness that people around the world can use their intelligence to share and help others! ALL THE HIGH FIVES! Great work!!! 🙂 🙂 🙂 Thanks so much!! I no longer see the Alexa Skills kit under the Lambda function. How should I proceed? 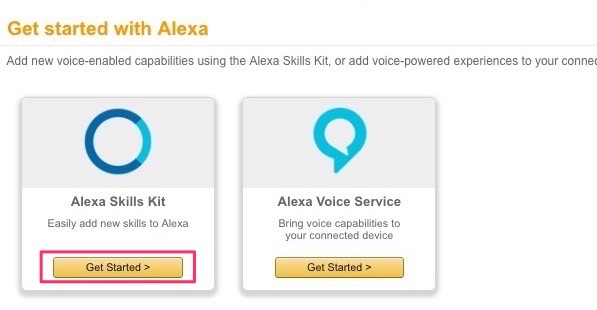 In Step 10, Alexa Skills Set is no longer listed. Did Amazon take it out to avoid things like this? What’s another option? Disregard my comment. Changed region and now it’s there. Outstanding…worked first try and I’ve never done anything like this before. Appreciate the knowledge shared!!! 1. What happens if you add a second language for app for both UK and US within developer.amazon.com? 2. My app isnt showing on my Alexa app. I definitely used the same login details. The Google skill i located under “your skills” top right corner above the search icon. You cant search for it as its not published. This worked perfectly, thank you for the great tutorial! Thank you!! This works so beautifully! It took a moment for it start working and I’m delighted to say it works on all of my Alexa devices. I love Alexa and now she is even more useful to me. Thank for sharing this information with us; you have made me look like a rock star to my family and friends! THIS IS AWESOME! Thank you so much! Worked first time, even for an idiot like me! Did I miss something? Do you have a fix for this? I wish I found this sooner. Alexa’s default search is severely lacking, now that is fixed 🙂 I think I will be using my echo twice as much. Keep up the great work! I got as far as #28 and after hitting Next it says Please wait while this Alexa skill is updated and it just goes around and around and nothing more takes place. Any ideas? Disregard, I switched to Chrome from IE11 and it worked fine. Seems that I first need select a Blueprint — which one and what do I do with the zip file? Brilliant, thanks ever so much, even I could follow the instructions and it’s working perfectly. Awesome skill, thanks so much for sharing and providing such easy to follow instructions. Took a little time and patience but it works great!!!!!!! Thanks!!!! Starting with step 9, this seems to be all out of date. There is no box with a dotted outline, and the next screen isn’t the same either. You’re right. Thanks for the heads up, Lee! I just updated the tutorial to reflect all of these new changes. Thanks again! I don’t understand this message and it was all created under the Alexa Skills Kit, so why this message? Amazon changed the layout again. I updated the tutorial to reflect the changes. See step #10 & 11. This was an excellent addition to my Echo Dot. thank you for both this written tutorial as well as the youtube version. The layout for the AWS page changed again. I just updated the tutorial with all new screenshots. Hi for some reason the save option on step 14 is not highlighted just test? Make sure you hit the Add button on the bottom of the page after adding Alexa Skills Kit in step 10.